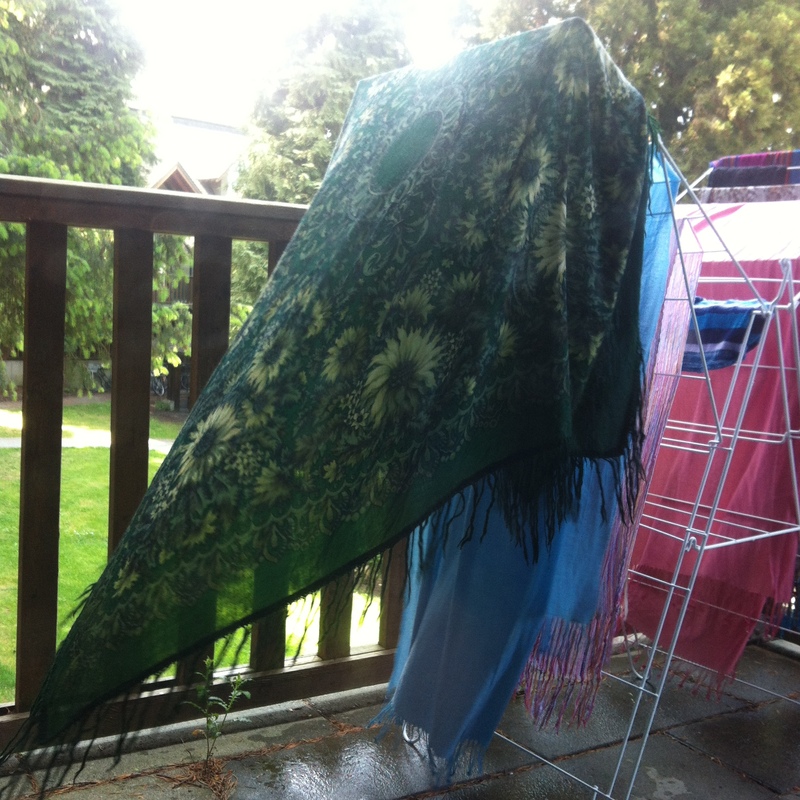 I washed my scarves today: cold water, delicate cycle, air dry… handle with care the tags say. I took extra time with this green scarf that belonged to my grandmother who died many years ago. I remember she used to wear this scarf, but didn’t really want to take pictures in it, because she thought it made her look unrefined and common. Как бабка, she would say, and take a string of pearls to put on. But I kept this scarf after her death, and I think that she would’ve liked it though, the fact that it is a memory keepsake for me. My mother kept the pearls. My grandmother, she was one of those old-school ladies. She went though wars and hunger, she was building the better future for the country, she was pushing the boundaries of scientific thought, she was writing, giving speeches, running things. She didn’t take time for herself, she didn’t share her feelings, she never wanted to be a burden. This scarf reminds me of my grandmother. It is old and washed out, its colours run, it is prickly and quite uncomfortable to wear, but it is also delicate and can tear easily. So, I handle the scarf with great care, just as my grandmother deserved to be treated. She didn’t allow it for herself, so I am doing it for her. We all need a little bit of extra love every so often, especially those of us in this crazy academic world. Let this be a reminder to handle ourselves with care before it is too late.